Greg Martin has been a collector of antique weapons since childhood. 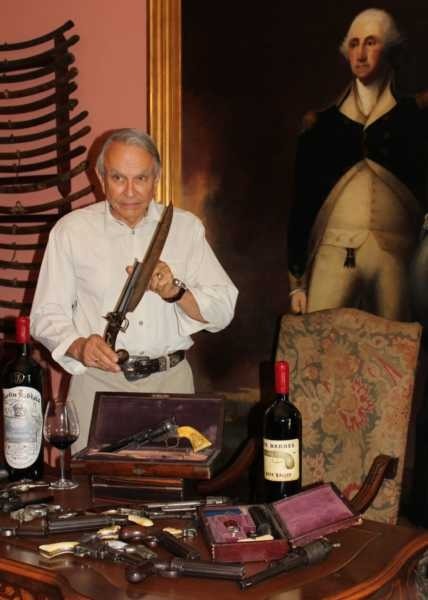 He has amassed a significant personal collection of antique firearms and historic artifacts, and is a trusted authority on the subject. Of the top 20 highest prices realized for arms and armor, Greg Martin was directly responsible for 12 of the records achieved. He contributed to articles on collecting and investing in historical artifacts to numerous publications and has lectured widely on the subject matter, including presentations at the Smithsonian Institution and the International Monetary Conference. In addition, Greg Martin was featured in many publications, including: The New York Times, Art & Auction, The San Francisco Chronicle, The Robb Report, Cigar Aficionado, Opulence Magazine, Wealth Magazine, San Francisco Magazine, The New York Post, The Los Angeles Times, Forbes, and Business Week. He has been interviewed about various aspects of antique arms and armor on major television networks including: FOX, NBC, ABC and CNN, and on various radio programs in several countries. Greg Martin appeared on the PBS series Antiques Roadshow, Discovery Channel’s The Search for Amazing Treasures, and The History Channel series’ Tales of the Gun, Discovery Channel’s Mythbusters, and most recently on FOX Business series’ Strange Inheritance. He was a regular host on HGTV’s Appraise It! and was profiled and featured in the BBC production Antique Arms. Greg Martin lent his expertise and collection to the major motion picture documentary In the Blood about President Theodore Roosevelt’s 1909 African Safari. 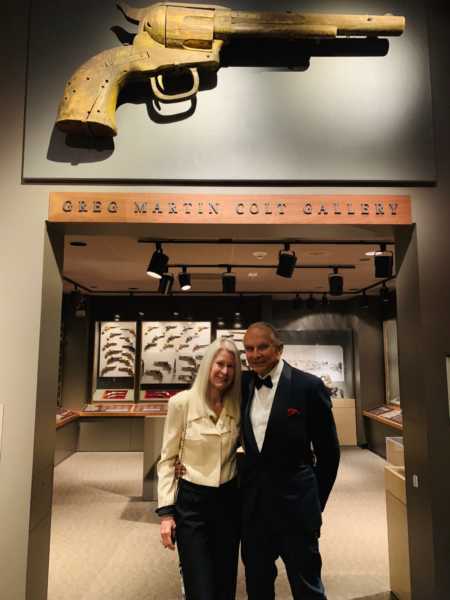 Greg Martin is a member of the Arms & Armor Society of New York, a Honorary Director and Lifetime Member of the Texas Gun Collector’s Association, and for 30 years has been a Trustee of the Autry Museum of Western Heritage in Los Angeles. He provided the Autry Museum with an endowment that has become the Greg Martin Colt Gallery, highlighting the history of Samuel Colt’s Revolver. In addition, he served for two terms as a Trustee of the California Historical Society. Petra and Greg Martin at the Greg Martin Colt Gallery, The Autry Museum of Western Heritage, Los Angeles, California. From 1986 – 2002, Greg Martin presided as Director and Leading Authority over the Arms & Armor Department at Butterfield & Butterfield Auctioneers in San Francisco, founded in 1865. During that time, Martin built Butterfield’s arms department into the world’s largest and most successful – achieving record prices and total sales of over $200,000,000 in antique arms, armor, militaria and historical memorabilia. In January 2002, he formed Greg Martin Auctions – GMA – with two veterans of Butterfield’s: Bernard Osher, its former owner, and John Gallo, former President of the company. From 2002 to 2009, GMA sales went from $4,500,000 to over $16,000,000 annually. Greg Martin is an avid marksman who has hunted big game in Africa, North America and Europe. He is a Lifetime Member of the National Rifle Association, and worked with the NRA to form its Endowment Fund strategy, which is now engaged and provides valuable fundraising. Due to his expertise, Mr. Martin has long been recognized as an academic and valuable resource to writers and publishers. For research purposes, he contributed extensively from his private collection, which formed the foundation of reference for noted author R.L.Wilson, recognized as the most known writer of reference material in the field of antique arms and related collectibles. Mr. Martin wrote the introduction, and edited the First Edition of the Blue Book of Antique American Firearms & Values, published in 2016 by Blue Book Publications, Inc., and provided the Foreword to the 2019 Second Edition. Greg Martin’s personal collection is highly regarded as one of the finest private collections in America. Some of his highly collectible arms formed the theme of the motion picture, In the Blood, the profile of Theodore Roosevelt, in which Mr. Martin himself was featured; as well as the film Son of a Gun, produced by Sony Movie Productions. His most impressive Gold Rush Collection was displayed at the Oakland Museum of California, and it traveled to the Quebec Museum and the Paris National History Museum. Mr. Martin also lent part of the collection to Shreve and Company, San Francisco, for their 160th Anniversary. There is little doubt that Mr. Martin is recognized as a premier expert, collector, dealer, and consultant in his field. His ongoing success, both within the private sector and auction venue with partner companies is unparalleled by any other individual in the arms, armor, and related collectibles industry.